This high quality HPS Grow light bulb can produce a very balanced and efficient spectrum of lights, brings you the best yields in flowing, budding and fruiting. It emits a red/yellow spectrum that is among the most energy efficient sources of indoor sunlight and extends the growing season. iPower 1000-Watt High Pressure Sodium HID light bulb is an efficient lighting solution for industrial applications such as warehouses, post top lights, and parking lots. It has a long life of up to at least 24,000 hours. iPower HID HPS bulb is ideal for use in security lighting, roadway lighting and warehouses. While growing a garden indoors is a great way to enjoy fresh produce all-year long, you'll need extra lighting in order to produce healthy and dense vegetation. IPower High pressure sodium or HPS grow lights emit a strong, warm white light that helps to stimulate plant and flower growth. The Kelvin color temperature of these bulbs can range from 2100K to 3000K with multiple wattage options. High pressure sodium grow lights emit a lot of red spectrum light which is better suited for the flowering stage. They also emit a higher than average amount of blue spectrum light which is beneficial during the growth cycle of plants. They are not well suited during vegetative growth, since plants typically need the crisp white wavelengths of metal halide grow lights. For this reason, many indoor growers switch their lights as needed. iPower HPS grow lights tend to be much more efficient than other alternatives and have a longer life span, saving you money on energy bills and replacements. 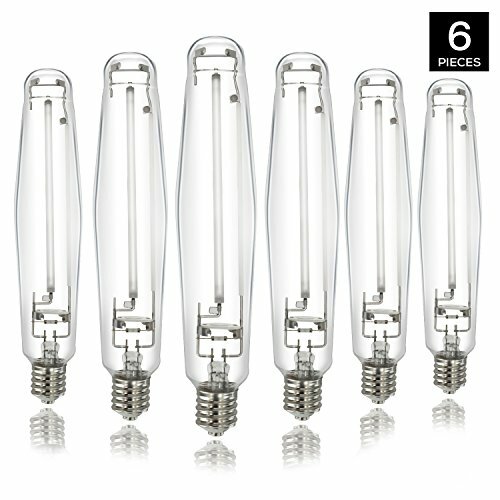 Although they are about 30 percent more efficient than incandescent, much of the power consumed by an HPS lamp is lost as heat. Because these lamps do put out a lot of heat, it's important to keep them about 12 to 18 inches away from the plant. Anything closer than that will start to burn most plants. The heat generation may be an issue in warmer climates or the summer months, but it can help mitigate the cold in the winter or colder climates.